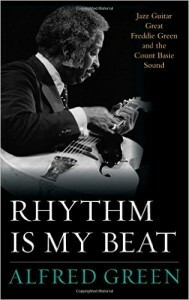 Published in the series Studies in Jazz overseen by the Institute of Jazz Studies at Rutgers University, Rhythm Is My Beat documents the career of Freddie Green, seemingly universally acknowledged as the greatest rhythm guitarist ever, in any genre. His genre was jazz. Because the author is the musician’s son, readers might expect mawkishness, but the text is neither sentimental nor particularly emotional. It provides biographical details in a straightforward manner, never milking them for effect. Once Alfred Green begins discussing the guitarist’s career, however, details about his father’s private life decrease significantly. In focusing on music, not biography, Alfred Green presents a good overview of his father’s career, almost all of which—half a century–was spent with the band of Count Basie (thus, the book’s subtitle). He begins strongly by using photographic evidence to prove that in early 1937 his father played at the Black Cat Club in New York City with a group led by saxophonist Lonnie Simmons, a friend from South Carolina. (Green was from Charleston.) Because Green left relative anonymity with Simmons for the big time with Basie, details about the Black Cat engagement are important; they are also sometimes misunderstood. In the autobiography John Hammond on Record (1977), impresario Hammond states that Green worked at the Black Cat with the group of Skeets Tolbert, not Simmons, a claim repeated by some jazz writers because Hammond was in a position to know: he discovered Green at the club, thought him a good fit for Basie’s rhythm section, and introduced him to Basie. In other words, he was instrumental to the careers of both Green and Basie. Yet in identifying the group with which Green played at the Black Cat, Hammond is demonstrably wrong, as Alfred Green proves. He sets the record straight. Anyone familiar with Basie’s band from 1937 until the leader’s death in 1984 and beyond it to Green’s death in 1987 will necessarily know the contour of Green’s career because of Green’s long, almost unbroken tenure with the leader, beginning in 1937. “Almost,” because of occasional illness, but also because Basie bowed to economic and musical realities (accommodating the new music known as bebop) by reducing his band to a small group in 1950, one that initially excluded Green. About two months later, though, the guitarist joined it, apparently by insisting that Basie employ him. At the urging of Billy Eckstine and Basie’s manager Willard Alexander, Basie discontinued the small group and by 1951 reconstituted a big band, which included Green. This organization relied more heavily on written arrangements (by the likes of Neal Hefti and Ernie Wilkins) than had previous versions of the band, which often played head arrangements (those that are spontaneous, or played from memory). Yet whether Basie led a relatively unrestrained band or one controlled by formal arrangements—or fronted no more than ten musicians—Green was, with a few brief exceptions, a constant, providing a dependable 4/4 beat that, with the remainder of the rhythm section, made the band swing. Not only did he create the beat, but when a musician violated it or was less than decorous on stage, he expressed dissatisfaction by glaring at the offending party with a gaze known as “the ray.” In so doing, he served as an enforcer, as the person who insisted that the band’s musicianship and integrity be maintained. Despite being known primarily for his association with Basie, Green had a musical career apart from him, as the author documents in a discography of thirty-four unnumbered pages. Green was attractive to other musicians for the same reason Basie valued him: his ability to provide a steady beat. As a result, he performed on hundreds of recordings as sideman, beginning with Teddy Wilson and Billie Holiday in 1937 and concluding with Diane Schuur three days before his death at age seventy-five. He played at numerous sessions led by Basie’s instrumentalists, such as Buck Clayton, Paul Quinichette, and Lester Young, but also at ones led by musicians who had not been regulars with Basie, including Mildred Bailey, Ruby Braff, Bob Brookmeyer, Ray Brown, Benny Carter, Al Cohn, Nat Cole, Roy Eldridge, Coleman Hawkins, Woody Herman, Illinois Jacquet, Gerry Mulligan, Buddy Rich, Tony Scott, Sonny Stitt, Sir Charles Thompson, and Sarah Vaughan. With some of these and other leaders he participated in recordings that have proved enduring, including “This Year’s Kisses,” with Wilson and Holiday (1937); “A Sailboat in the Moonlight,” with Holiday (1937); “Ad-Lib Blues,” credited to Benny Goodman, though the clarinetist does not play on it (1940); Charlie Parker’s album Night and Day (1952); Sing a Song of Basie, by Lambert, Hendricks, and Ross (1957); and Ray Charles’s Genius + Soul = Jazz (1960). Most important for his playing, Green also composed tunes, two of which are popular in jazz circles: “Down for Double” and “Corner Pocket”; the latter has been recorded over a hundred times, sometimes as a vocal titled “Until I Met You.” Alfred Green relates an engaging anecdote about what inspired Manhattan Transfer to record this piece, its version of which won a Grammy (130-31). The book includes an apparent contradiction about the number of tunes Green wrote. The author states that his father composed “in excess of thirty tunes” (132), but Mark Allen, who compiled the list of Green’s compositions that appears in appendix K, records only twenty (239-41). One wonders why, if Green wrote at least thirty, Allen fails to account for the other ten or more. Alternatively, Allen could be accurate and the author is mistaken. Alfred Green should have resolved this issue. Green’s narrative constitutes a little over half of this 325-page book. Fourteen appendices compose most of the other pages. The appendices consist mainly of essays—mostly (all?) by authors other than Green—about the guitarist’s technique and style that will likely interest musicians, not ordinary readers. Photographs enhance the book. Candid shots, which are especially appealing, show Green in a street scene looking dapper, seated at a club with Billie Holiday and Lester Young, pretending to fight the boxer Sugar Ray Robinson, golfing separately with Billy Eckstine and Joe Williams, and, in a beautiful picture, shaking hands with President Reagan at the White House. There are many others. Though Green adequately chronicles the career of an important musician, his text has problems. When using the word “always,” for example, he does not allow for exceptions when exceptions clearly exist, as when stating that “John Hammond was always on the prowl” (47) and that Lester Young played “to a meter that was always a fraction-of-a-beat ahead of him” (58). Hammond never slept? Young never played on the beat, even in ensemble passages? Green offers opinions as facts, as when claiming that Jimmy Rushing was “the best blues singer around” (74) and that saxophonist Frank Wess was “incomparable” (77). Though the author documents many of his statements, he sometimes fails to do so when proof is needed, as when stating that “Lester Young struggled to keep his emotions intact” following the death of saxophonist Herschel Evans and that, as a result, saxophonist Jack Washington “often had to help the distraught [Young] to the stage and his seat” (59). Green is sometimes credulous. Does he really believe that bandsmen “peed from the moving bus with the door partially open” (78)? (Try imagining it.) Or that, despite the claims of Frank Wess and Benny Powell, an opened can of sardines fell from an overhead bus rack and landed on singer Joe Williams’s head, where it remained for the remainder of the trip (81)? On the topic of music, one wonders why Green characterizes Dizzy Gillespie, Fats Navarro, and Charlie Parker as hard-bop players (98) and why, other than listing it in what is termed a “selected discography,” he ignores The Atomic Basie (1957), arguably the most impressive post-war Basie big band album. Identifying Ruby Braff as a “neo-Dixieland trumpeter” disserves the musician (246). Most disconcerting, though, are constructions such as these that, first, use the wrong case and, second, feature a dangling modifier: a “tiff between he and Hammond” (68) and “In interviewing John Williams . . . , the twenty-five-year Basieite once asked me . . .” (91). Because Green was unaware of these problems, his editor should have corrected them. In sum, Alfred Green adequately summarizes his father’s career without getting bogged down in details or becoming technical when discussing music. That is, general readers can enjoy the book, though they will be distracted by writing lapses such as those mentioned here.